Entrepreneurs can pitch ideas about a new concept or product and begin creating their own business at an event, later this month in Exeter. Startup Weekend, a 54-hour event, will help people develop solutions and ideas that have the potential to make a positive difference to society. The weekend takes place from 17 to 19 November 2017 at University of Exeter’s Business School and is open to anyone with a novel product, idea or code – with the drive to turn their ideas into a startup business. Teams will be supported to build a product or service and then present their idea to a panel of experts. Mentors will be on hand throughout the weekend to provide expertise and give talks on their experiences in the fast-paced world of startups. The University of Exeter, Business School was recently voted as having the top MBA program for sustainable social change with a score of 95.6 per cent according to Corporate Knights, a magazine for clean capitalism, in its 2017 Better World MBA results. 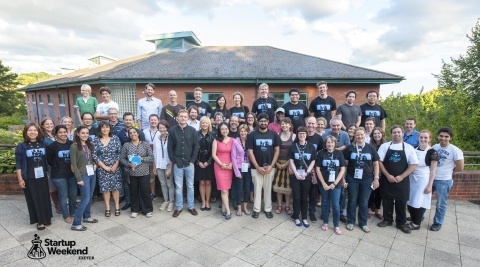 Some of Exeter’s most recognized entrepreneurs, supported by Think:Try:Do, the University’s Student Startup Programme, will be returning as mentors for the event. These include: Tom Charman of Kompas, a digital travel app, who is also pitching at the SETsquared Accelerating Growth Investment Showcase event in December as they look to complete their current investment round. Exeter entrepreneur, Matt Morley is co-founder of Explaain, a plugin for news websites that instantly makes articles interactive and user-friendly. The team are working closely with Google’s Digital News Initiative. Matt will also feature as a mentor. Another Exeter alumnus, Chris Howard, founder of The Rattle, a community and co-working space for music makers and entrepreneurs (which recently overfunded their Crowdcube raise) will be in Exeter for the build up to Startup Weekend, during Global Entrepreneur Week (13-19 November) to run a session helping people deliver a one minute pitch.